While their primary purpose is to hold and conceal cage lights, vivarium hoods also transform amateur-looking reptile cages into showpiece exhibits. While commercial models exist, it is easy and relatively inexpensive to construct your own. By building your own hood, you can customize it to suit the needs of you and your pet. A hood need not be elaborate -- it is essentially a box with only four solid sides. The top, front and sides are closed, but the bottom is open so the lights can shine into the cage, and the back is open to allow access to the lights. Fancy models feature hinged or sliding doors to allow users to access the lights from the front. Vivarium hoods for top-opening cages are much more complicated to construct than those for front-opening cages. Because you must access your animals via the top of the cage, hoods for top-opening cages must be completely removable -- causing access to be labor-intensive -- or have some type of door. By contrast, hoods for front-opening vivariums can be essentially permanent, as long as you have access to the light fixtures so you can change the bulbs as necessary. 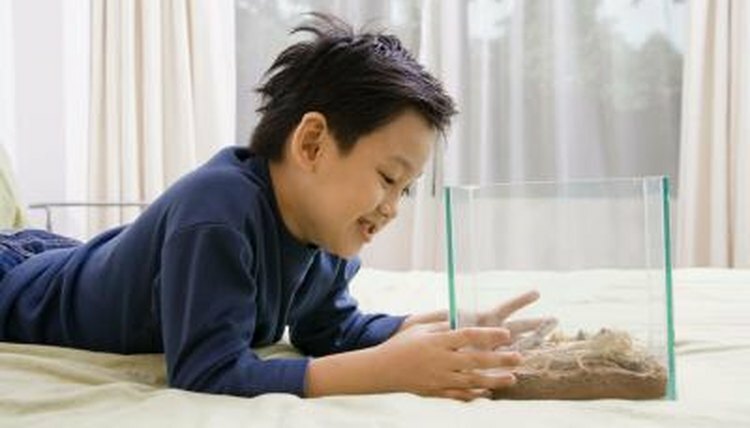 Measure your vivarium carefully to determine the lengths you will need. In the simplest designs, the front and top piece will be the same size; the side pieces will also be equal. The front and top pieces should be about 1 ½ inches longer than the length of the cage -- this overhang will hide the sideboards from view. Most aquariums and vivariums are about 12 inches deep, but measure carefully -- the side pieces should fit the sides exactly. Construct your hood out of pine or hardwood lumber: 12-inch-wide, 1-inch-thick boards cut to the correct lengths will form most of the structure. Screws and glue suffice to fasten the boards together, though hoods for large cages should use brackets for additional support. Pre-drill all holes before inserting the screws to avoid splitting the wood. You can paint or stain the wood, but be sure to let it air-dry for several days before using it near the cage. If you would like, you can install small metal brackets inside the hood; these will hold the weight of the hood and allow it to slide down over the top of the cage, providing a polished, professional look. The types of light bulbs necessary for the hood depend on the cage inhabitants. Provide invertebrates, fish, amphibians, snakes and forest-dwelling lizards with high-quality full-spectrum lights, but they require no ultraviolet radiation. Sun-loving lizards and turtles require lights that produce significant UVB light; additionally, this light must be within 12 inches of the animals. Glass and plastic filter out the UVB component of light -- you must keep animals requiring such light in screen-topped vivariums. Mount fluorescent light ballasts or ceramic fixtures for incandescent bulbs on the inside “ceiling” of the hood. Always mount heat lamp fixtures at one side of the cage to create a thermal gradient.